Posted on October 4, 2016 by Philip O'Hanlon. 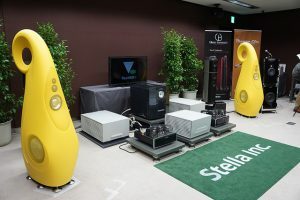 Vivid Audio launched their new flagship speaker over the past weekend at the Tokyo International Audio Show and at the Hi Fi Messen in Norway. GIYA Spirit is the culmination of eight years of work during the development of the GIYA line where it became obvious that should we build a new GIYA flagship speaker we would make noteworthy advances to the product line by doing so. 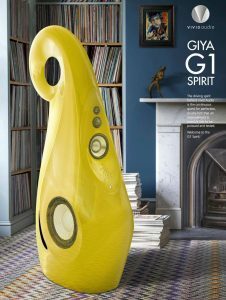 The Spirit projects the logical enhancement of our flagship speaker, the GIYA G1 to the Spirit. Spirit has come about because of the incredible performance it is able to deliver due to these numerous enhancements. Spirit utilises a completely new carbon stiffened 125mm low mid driver which has a flat frequency response to beyond 10khz! This is certainly a world first. The C225 bass units now use a motor assembly able to handle double the power of the current G1 design. A 100mm copper clad aluminium edge wound single layered voice coil is used for the first time. The new D26k and D50 drivers (B1 Decade style), are used in conjunction with these new drivers. New cross over topologies are implemented with new components exhibiting improved thermal tracking. High quality 99.9% OFC copper air cored inductors are used throughout. If you thought that the Giya G1 had state of the art bass, then you will be bowled over when you hear what the redesigned 11 1/2″ woofers are capable of. With twice the power handling, greater excursion, larger diameter voice coil and neodymium magnets that are approximately twice the size of the regular Giya G1’s woofers. 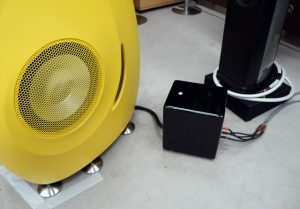 The lower midrange woofer has also been updated and delivers a fuller, richer midrange compared to previous Giyas. The highs have not been forgotten; building upon the crossover technology designed for the B1 Decade, the high frequency performance is now airy & silky smooth. A new cabinet design with extensive new bracing and strengthening, that is 4″ lower than the Giya G1, puts the tweeter on axis with the listener’s ears. Finally, the crossover has been removed from the speaker cabinet and placed in its own carbon fiber enclosure. Thus removing the crossover components from the vibration inside the cabinet itself; giving a purer less corrupted musical signal. We will announce at a later date the official launch of this exciting new reference caliber loudspeaker system and also plan on showing these at CES 2017. Stay tuned. This entry was posted in Latest News and tagged G1Spirit, Vivid Audio.